The Russian army was in a state of transition during the 1808 war with Sweden. They were changing into a new high level organization, new uniforms and flags were introduced, and it seems that new infantry tactics were tried out. 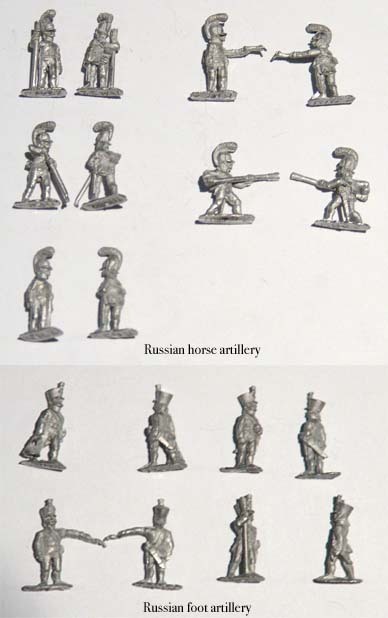 We chose 1805 uniformed figures from Minifigs and Roundway (Navwar), mainly because they are one of the few who produce something else than the 1812 range, the figures are readily available, not too expensive, and go well with other 15 mm figures. Minifigs are slimmer than Roundway, but the ranges can be mixed, creating a suitably ragged “campaign look” for the units. The Roundway infantry NCOs and officers in particular add life to the mainly minifigs stands. Image of some of the minifigs figures used. Roundway artillery crew figures. Painting the 400 or so figures was a very fast affair. The figures were cleaned up, hot-glued to cardboard strips, spray primed black, then basic colour and highlights were used. The figures were finished by washing the hands, musket and face with dark red brown and lightly dry brushing the figure with grey sand colour. 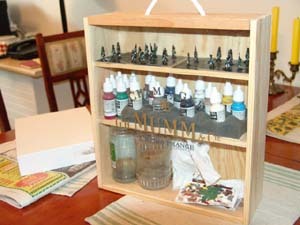 The painted figures were mounted on artist board and the base was flocked. The russian musketeers and grenadier companies were painted in the 1807 uniform. The coat is dark green, collars and turnbacks are red. Trousers are white with black leggings. Greatcoats were painted in variouts shades of brown, forage hats are dark green with a red band. 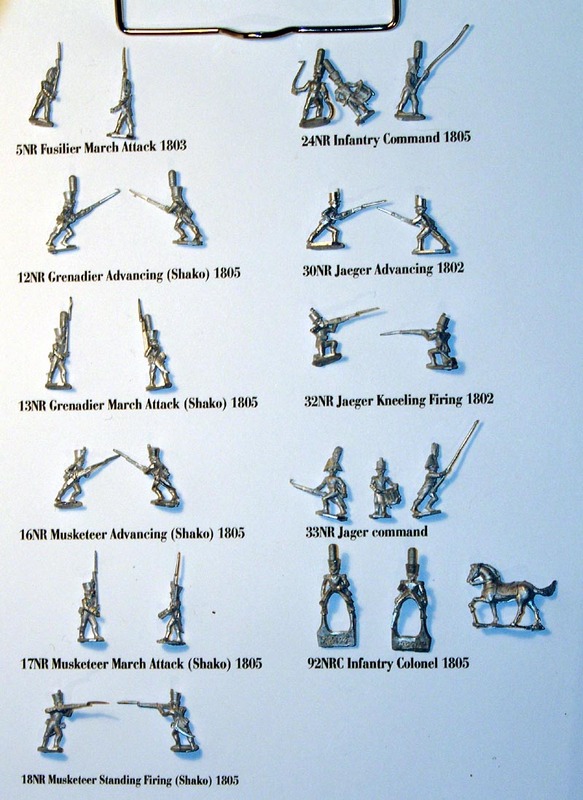 The following table lists some or the musketeer regiments and their regimental distinctions. At this stage the russians had started organising their army into divisions, and each regiment had different flag stave and shoulder strap colours based on their seniority in the division. (Please refer to the Osprey Men-at-Arms 185 or other literature for more information). Officers had a gorget and a hat with a black plume. NCOs had a golden band in the shako. Although officially recalled from use by 1808, I painted a few NCOs with a spontoon, because it simply looks good to me and the Russians seem to have been fairly lax with uniform regulations. The basic square flag images were touched up in photoshop, and skewed to better simulate the look of a cloth flag. Jägers were painted in the light green 1805 uniform. Jacket and trousers were light green, some white trousered figures were mixed in. The regiments had distinctive collar, cuff colours and pompom center colours. Leatherwork is black. Officers have a hat with a tall green plume. Jägers did not carry flags in the field.